Wholesome and nutrtitious treats for your feathered companion. Natural dried blueberries are infused with the natural sweetness of apple juice. These juice infused berries contain no added sugar or corn syrup. As a rich source of antioxidants and vitamins, natural dried blueberries are the perfect treat for smaller birds. Human grade. These are of the smaller variety and are approximately 5/8" in diameter. Freeze Dried Butternut Squash Chunks. Serve as a dried treat or soak and serve wet. Roasted Sweet Corn has a smokey, savory component that gives it a straight off the grill flavor! Perfect to for adding to any cookable foods! Serve as a dried treat or soak and serve wet. Real Rewards™ Garden Mix Treats for Medium Birds offers a delicious mix of carrots, peas, almonds and zucchini to provide reward occasions for those special moments you share with your bird. 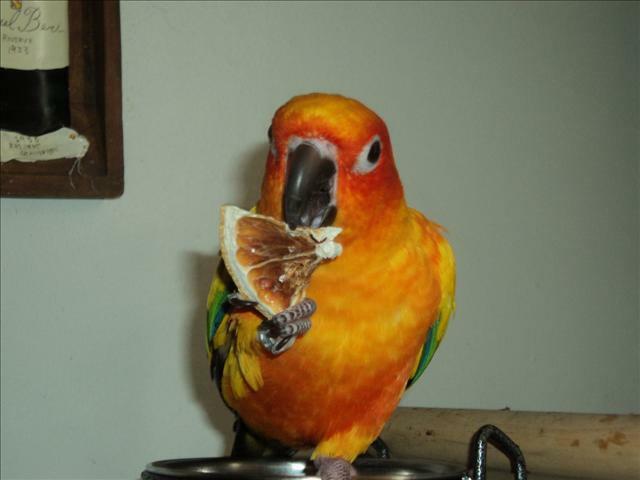 Real Rewards™ Tropical Mix Treats for Medium Birds offers a delicious mix of peanuts, pineapple, mango and coconut to provide reward occasions for those special moments you share with your bird. Sensible Seed™ Bird Food for Small Birds is a premium blend of seeds and FruitBlend® Flavor Smart Pellets™ to provide your bird a sensible way to indulge in a seed mix. This blend includes a delicious mix of right-sized pieces for your bird which helps minimize wasted food. Sensible Seed™ Bird Food for Medium Birds is a premium blend of seeds and FruitBlend® Flavor Smart Pellets™ to provide your bird a sensible way to indulge in a seed mix. This blend includes a delicious mix of right-sized pieces for your bird which helps minimize wasted food. Pure Fun™ Bird Food for Medium Birds is a premium blend of seeds, FruitBlend® Flavor Smart Pellets,™ vegetables and fruit to help excite and enrich your pet bird. This blend includes a delicious mix of right sized pieces for your bird which helps minimize wasted food. Pure Fun™ Bird Food for Parrots and Conures is a premium blend of fruit, FruitBlend® Flavor Smart Pellets,™ vegetables and nuts to help excite and enrich your pet bird. This blend includes a delicious mix of right-sized pieces for your bird which helps minimize wasted food. For Finches, Canaries, Parakeets, Doves, Parrotlets, Lovebirds, Cockatiels and other little beaks. This awesome blend contains Buckwheat, Flaxseed and Chia Seeds, along with freeze-dried blueberries and dehyrated coconut. Fortified with Natural Bee Pollen - nature's miracle supplement! Does Not Contain Peanuts. Amazing, delicious, and crunchy beet chips. Human grade. Repackaged from bulk. Amazing, delicious, and crunchy beet chips. Human grade. Known as the anti-aging fruit, goji berries are an excellent source of antioxidants, vitamins A and C, amino acids, potassium, iron, zinc, and more. Human grade. Hand crafted in the USA on Stainless Steel wire with almonds in shell, kiwi, papaya, apricots, pineapples & apples along with leather washers for added texture. 6-7" in Diameter. Refillable. Hand crafted in the USA on Stainless Steel wire with almonds in shell, kiwi, papaya, apricots, pineapples & apples. 6-7" in Diameter. Refillable. Hand crafted in the USA on Stainless Steel wire with almonds, pecans, hazelnuts, walnuts and macadamia nuts. 6-7" in Diameter. Refillable. Handcrafted, deliciously crunchy treat bar. Also contains carrots and pumpkin seed hearts. Satisfies bird's natural pecking instincts. Made in USA. Recommended for smaller birds, such as conures, caiques, pionus, quakers, ringnecks and similarly sized birds. Handcrafted, deliciously crunchy treat bar. Also contains egg food and coconut. Satisfies bird's natural pecking instincts. Made in USA. Recommended for smaller birds, such as conures, caiques, pionus, ringnecks and similarly sized birds. Handcrafted, deliciously crunchy treat bar. Also contains bananas and apricots. Satisfies bird's natural pecking instincts. Made in USA. Recommended for smaller birds, such as conures, caiques, pionus, ringnecks and similarly sized birds. A great treat blend for small to large birds, from conures to macaws! Fortified with bee pollen. A fun addition to your regular diet, or an evening treat. Contains dehydrated cherries, dehydrated papaya, dehydrated cranberries, dehydrated sweet peppers, dried diced apricots, dehydrated pineapple, dehydrated apples, dehydrated sweet potatoes, dehydrated green beans, dehydrated mangos, dehydrated carrots, dehydrated beets, green fried peas and Veggie Crisps. GMO Free. No Corn. No Peanut blend. Please note that this is not a substitute for fresh vegetables and is to be used as a treat. Please keep in a cool location or refrigerate for added freshness and especially in warmer climates. Great training treat! Banana chips are to be fed as a treat only and in moderation. These plump raisins are giant, the largest around! Our jumbo seedless raisins are about two to three times the size of a regular raisin, because they ripen on the vine for a long time while they achieve maximum delicious sweetness. These beauties grow as green grapes on the vine, and develop this lovely dark brown color naturally while drying in the sun. Super as a training reward or foraging treat used in foraging toys. Millet for birds is an ideal snack. Feed this seed alone or create your own blend with several types of birdseed. Canary seed for birds is an ideal snack. Feed this seed alone or create your own blend with several types of birdseed. Canola (Rapeseed) for birds is an ideal snack. Feed this seed alone or create your own blend with several types of birdseed. Great training/reward treat! Yogurt drops are to be fed as a treat only and in moderation. Human grade. Please note: during the summer months, this item may melt during shipping. Please be mindful of this when ordering. Thank you! Simply freeze-dried strawberries and bananas. No preservatives. The real deal! A great training or reward treat, or an added ingredient to your own bird mix. Recommended by My Safe Bird Store as a treat. Use it in foraging toys, or stuff it in between a huge pine cone or a smaller pine cone for the little beaks! Add some crinkle paper for even more foraging fun! Recommended for small to large birds, from Conures to Macaws. A crunchy treat with a unique nutty flavour that birds love. Tasty rice cracker nuggets coated with sesame seeds hide a delicious roasted peanut center. These bite size treats are sure to become a snack time favorite! Great for small to big beaks. My Safe Bird Store recommends safflower seed as a treat or training reward. Niko, our official finicky Taste Tester, gives this two toes up! This awesome blend contains seven different tree nuts, including Walnuts, Almonds, Pistachios, Pecans, Hazelnuts, Cashews, Brazil Nuts and Hickory Nuts, natural unsulfered cranberries and golden raisins, pepitas, almonds, carob drops and safflower.Can be used as a treat or mixed in with their favorite pellets for a great dry diet. GMO Free. No Corn. No Peanut blend. A crunchy, fun treat for your bird! Mix in with their favorite dry food mix. Birds of all sizes go crazy for this natural treat. Taste Tested and approved by Niko, the official finicky Timneh Grey! Chock full of eight different tree nuts (Walnuts, Almonds, Pistachios, Pecans, Hazelnuts, Cashews, Brazil Nuts and Hickory Nuts), pistachios in shell, natural coconut, papaya, kiwi, granola, pepitas, grains, fruits and treats, this crazy wild nut blend is a first choice for any medium to large parrot. Fortified with Natural Bee Pollen - nature's miracle supplement! GMO Free. No Corn. No Peanut blend. Clusters of golden millet right off the sprays. Can be fed in a separate treat cup or mixed with the bird's food for an added treat. Birds of all sizes go crazy for this natural treat.